Welcome to the world of round liquid bottles! 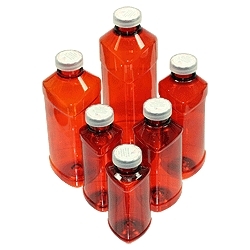 TSD is pleased to introduce the industry's first and only line of round graduated plastic bottles for prescription dispensing. In keeping concert with our ongoing committment to design, develop and introduce better containers, bottles and closures, we have again stepped "outside the box" the bring you a superior line of liquid bottles. Why round? In short, why not? Round bottles are stronger than ovals (weight to weight), balance better on counters and in medicine cabinets, and are distinctive and different in appearance. Furthermore, every pharmaceutical manufacturer uses round bottles - not ovals - when packaging their products, so we're in good company with this design. Our round bottles are made from Polyethylene Terepthalate (PET), a resin that is virtually impervious to chemical interactions with alcohol based cough syrups, polar solvents, and other organic substances. The manufacturing process we use imparts additional strength and barrier properties to the resin through a process known as "biaxial molecular orientation", further improving the drop and impact strength of the bottles, and giving them glass like clarity and gloss. And most communities have recycling programs that can take PET bottles so you don't have to discard these into landfills. All of the bottles also feature graduations in both ounces and milli-liters to help you fill them accurately. Finally, we top off the bottles with our exclusive, patented PRO PLUS™ convertible dual purpose closure. You don't have to ruin your hands or counter edges prying off outer shells of C/R caps to keep customers happy. With our PRO PLUS™ cap, conversion is a SNAP™. Add to that our larger mouth sizes to make filling and emptying contents easier without messy spills, and you have the most versatile, convenient, attractive and functional product available.